Art and culture must put down roots and draw their sustenance from the soil if they have to survive. From the Tabla wizards namely Ustad Munir Khan, Ustad Natthu Khan, Ustad Ahmedjan Thirakhawa, Ustad Gulam Hussain Khan, Ustad Habibuddin Khan, Pandit Kanthe Maharaj, Pandit Samtaprasad, Ustad Alla Rakha Khan, to the doyen of Farrukhabad Gharana, Ustad Amir Hussain Khan, the artistes in this country have had a vibrant, catholic tradition of creative interaction and assimilation of the past. All such stalwarts, whose list is endless, belong to this Rich Indian tradition and culture. This article is a humble tribute to my Guru, late Ustad Amir Hussain Khan. “Khansaheb” as he was affectionately and respectfully called by all of us, was the true embodiment of Indian culture. He saw the percussion instrument with the eyes of his soul and his own life, devoted to this art, exemplified the towering tenets of Indian culture. He not only preached the philosophy of “Simple living and high thinking” but also practiced it. I have seen no other man ever asking of life so little for himself! A teacher can never truly teach unless he is still learning himself. To quote Gurudev Rabindranath Tagore – “A lamp can never light another lamp, unless it continues to burn its own flame.” Khansaheb religiously did “riyaz” for hours on end, every day, so that he could not only attain perfection in the nuances of this art practiced in different Gharanas, but also impart the best training to his students. He himself was a student “par excellence” of his distinguished Guru, Ustad Munir Khan, who was a pioneer in introducing this art to Maharashtra – an art which, so to speak, was an exclusive domain of North India. 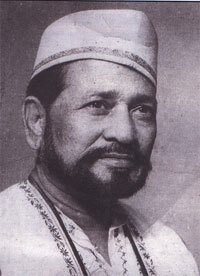 What is unique about Ustad Munir Khan was that he had mastered this art from as many as 24 Gurus of different Gharanas, enriched the treasure by adding to it his own superb inimitable compositions and popularized both ‘Khula’ and ‘Band’ ‘Baz’ in Maharashtra. No wonder he was justifiably credited with producing a plethora of distinguished artistes, such as Ustad Ahmedjan Thirakwa, Ustad Amir Hussain Khan, Ustad Gulam Hussain Khan, Ustad Habibuddin Khan, Ustad Shamsuddin Khan, Pandit Vishnooji Shirodkar and Pandit Subramama Ankolekar, to name a few. Ustad Amir Hussain Khan’s father Ustad Ahmed Baksh Khan was a renowned Sarangi maestro who was brought to Hyderabad from Meerut with state honors by the Nizam of Hyderabad. Ahmed Baksh started giving lessons to young Amir Hussain who showed scant interest in this instrument, as he was more attracted by the Tabla. His uncle Munir Khan therefore voluntarily took up the responsibility of giving him lessons in Tabla. He generously gave away all his knowledge to this little disciple, who did justice to this gesture by painstakingly picking up the knowledge. The boy diligently practiced Tabla solo and grew up to become Ustad Amir Hussain Khan of national and international renown. Ustad Amir Hussain Khan’s reputation spread far and wide. It so happened that the Maharaja of Raigadh State, Raja Chakradhar Singh, once brought him as a guest to his palace with full state honors. The Maharaja heard his solo for two hours every day for six consecutive days. On the seventh day, Khansaheb gave a breathtaking performance for a full four hours, without repeating a single “Bandish”. Overwhelmed by the superb skill of the artiste, the Maharaja bestowed on him a gift of 1000 Ashrafis (gold coins)! Khansaheb had the good fortune to stay with Ustad Munir Khan in Mumbai till the latter’s sad demise, i.e. from 1932 to 1937. He returned to Hyderabad after attending his Master’s cremation rites. At the instance of his friends and his father’s disciple Sarangi Maestro Chhote Khan, Khansaheb once again returned to Mumbai in 1945. His students Pandit Pandharinath Nageshkar, Gulam Rasool, Sharif Ahmed and Jamal Khan were instrumental in making him stay in Mumbai permanently. It was indeed a treat to watch Ustad Amir Hussain Khan play Tabla solo. He was a great crowd puller and always played before a packed audience. From a slow and steady beat, he used to effortlessly build up the rhythm into such frenzy that many in the audience used to go into an ecstatic trance. Every time the Tabla maestro performed, he spontaneously evoked hysteria among the youth, something not witnessed for any other classical musician, let alone a Tabla player! Ustad Amir Hussain Khan has been an inspiring and motivating force in my life. He was the living embodiment of the highest aspirations of all his disciples, the noblest instances of humanity, the loftiest attributes of the divine spirit in an earthly garb. His was not a life to be described in words or measured in years. He lived in Eternity! Copyright ã 2012 All Right Reserved.